Valuation is at the heart of investing. 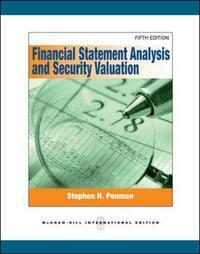 A considerable part of the information for valuation is in the financial statements. Financial Statement Analysis and Security Valuation, 5 e by Stephen Penman shows students how to extract information from financial statements and use that data to value firms. The 5th edition shows how to handle the accounting in financial statements and use those statements as a lens to view a business and assess the value it generates. The George O. May Professor and the Morgan Stanley Research Scholar in the Graduate School of Business, Columbia University. He also serves as co-director of Columbia's Center for Excellence in Accounting and Security Analysis. Prior to his appointment at Columbia in 1999, Stephen Penman was the L.H. Penny Professor in the Walter A. Haas School of Business at the University of California at Berkeley. From 1990-95 he served a Chairman of the Professional Accounting Program and Chairman of the Accounting Faculty at Berkeley. He also initiated and chaired Berkeley's Annual Conference on Financial Reporting. He has served as a Visiting Professor at Columbia University and the London Business School of Economic. Professor Penman received a first-class honors degree in Commerce from the University of Queensland, Australia, and M.B.A. and Ph.D. degrees from the University of Chicago.